A board book for bed time, this Sleepytime Prayer book is made to help kids keep God in mind as they drift off at night. Spending quiet time with God and your child before bedtime is an opportunity to teach your little one about God's tender love for us. Read aloud the comforting words in this book, while your child enjoys the tab figures on each page. 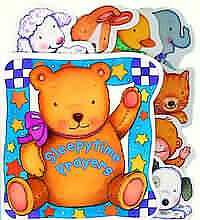 Sleepytime Prayers by Yolanda Brown was published by Authentic in February 2001 and is our 13994th best seller. The ISBN for Sleepytime Prayers is 9781860243912. Be the first to review Sleepytime Prayers! Got a question? No problem! Just click here to ask us about Sleepytime Prayers.